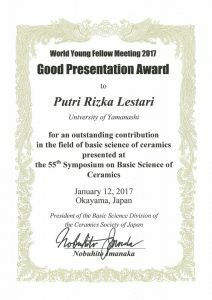 Ms. PUTRI RIZKA LESTARI WIN AWARDS IN THE ORAL PRESENTATION OF THE 55th SYMPOSIUM ON BASIC SCIENCE OF CERAMICS. 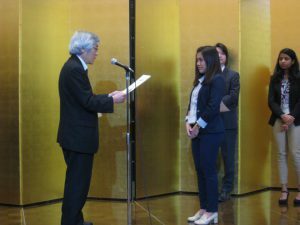 Ms. Putri Rizka Lestari won good presentation awards in the oral presentation of the 55th Symposium on Basic Science of Ceramics held at Okayama Convention Center, Okayama on January 12-13rd, 2017. In this meeting, four good presentation awards were chosen among 15 oral presentations.